TAG CORPORATION continues to push boundaries in providing excellence in servicing. Our futuristic vision has helped us to set up and successfully operate the one-of-its-kind One Stop Lab (NABL Certified Laboratory ISO/IEC 17025:2005). 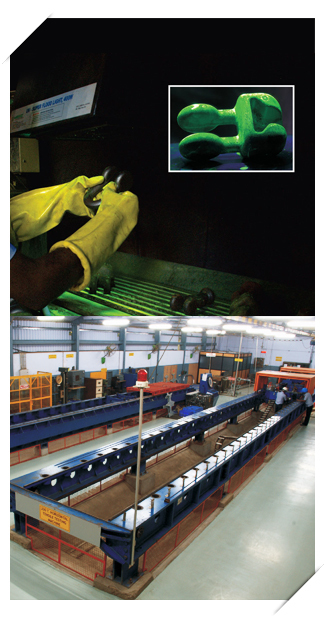 This is perhaps the only facility in India that provided end-to-end testing of component manufactured by others. We have all the necessary tools, procedures, machinery and people expertise needed to check EHV power transmission line equipment and conductors. We are a One Stop Test Laboratory (NABL Certified Laboratory ISO/IEC 17025:2005) for Conductor and Insulator manufacturer’s from around the world who use our facility for the entire Range of electrical tests such as Corona / RIV, Mechanical and Vibrations tests required for Transmission Lines and Sub-Stations. TAG CORPORATION has the unique distinction of being the only company in India to provide holistic, high performance and all-inclusive testing procedures under national and international standards. We provide testing of transmission line hardware fittings, accessories and conductors. Mechanical laboratory – This unit tests under extreme conditions, various aspects of EHV hardware fittings such as tensile, compression, torsion, bending, slipping and other mechanical testing of fittings. Vibration laboratory – We have an elaborate vibration testing laboratory for testing effects of vibration on insulator strings or V strings suspension, spacers, dampers and conductors, for up to 80 meters. Chemical analysis laboratory – The unit tests for precise chemical composition in alloys, dies and metal components, using highly powerful microscopes and Ozone apparatus. Rubber testing laboratory – This unit set up with technical collaboration with Du Pont, tests for determining tensile, elongation, conductivity, heat aging and ozone aging on the synthetic rubber components. Research and development laboratory – Our R&D facility carries out precision based testing of all EHV hardware fittings and components on various aspects like chemical composition, micro structure, vibration analysis, neoprene lined components and RIV/Corona analysis, assisted by the world class expertise of Du Pont, UK and Hydro Quebec, Canada.